Why is Othello black? Understanding why Shakespeare made his hero a Moor. Understanding why Shakespeare made his tortured, tragic hero a Moor. 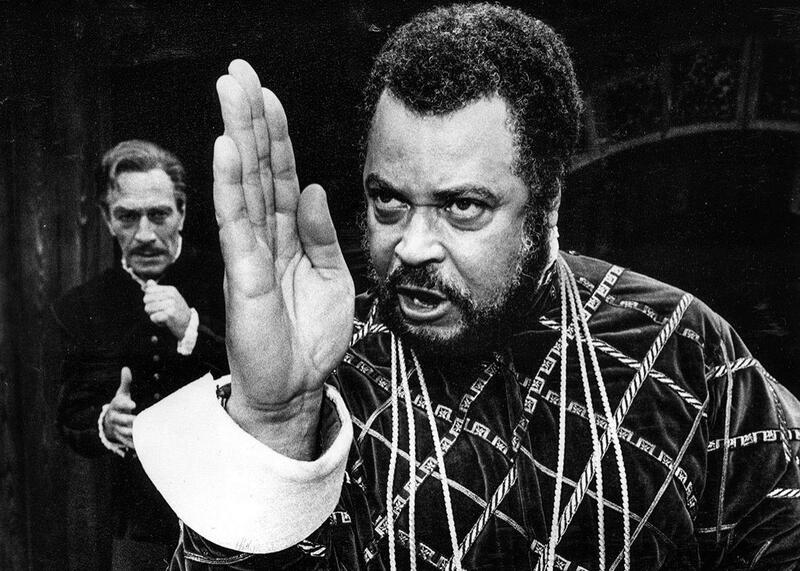 Actor James Earl Jones as Othello in 1981. Is Othello black? With the news that David Oyelowo will play Othello opposite Daniel Craig’s Iago and that the Metropolitan Opera is finally discontinuing the practice of blackface in productions of Otello, we may see a revival of this oft-asked question. What people mean when they ask if Othello is black is: What did Shakespeare mean when he called Othello black? Would we say Othello is black today? It’s an understandable question. Shakespeare’s writing mostly predates the transatlantic slave trade and the more modern obsession with biological classification, both of which gave rise to our contemporary ideas of race. When Shakespeare used the word “black” he was not exactly describing a race the way we would. He meant instead someone with darker skin than an Englishman at a time when Englishmen were very, very pale. Although Othello is a Moor, and although we often assume he is from Africa, he never names his birthplace in the play. In Shakespeare’s time, Moors could be from Africa, but they could also be from the Middle East, or even Spain. American actor John Edward McCullough as Othello in 1878. While the question is logical to me, as a reader, a director, and a lover of Shakespeare, it’s not the most interesting one. As language’s meaning evolves, so do these plays, even if their words remain exactly the same. To us today, the word “black” carries with it a specific cluster of associations informed by history, culture, stereotypes, and literature. Othello may have started in conversation with Shakespeare’s definition of blackness, but today, he speaks with ours. Before we hoist the Jolly Roger, we should consider more practical explanations for Shakespeare’s choice. In August of 1600, the ambassador of the King of Barbary—roughly, modern-day Morocco—came to London as the guest of Queen Elizabeth for a six-month residency at court. He was a celebrity, Katie Sisneros, a Ph.D. candidate at the University of Minnesota focusing on representations of Turks in English popular literature, told me in an interview. “He would’ve had some sort of public parade. People who had never seen a Muslim, never seen a Moor, they probably saw their first Moor during that visit.” Something of the ambassador’s charisma and dashing good looks remain in this portrait of him painted in England at the time. We know from records that Shakespeare’s company performed at court while the ambassador—his full name was Abd el-Ouahed ben Messaoud ben Mohammed Anoun—was there, which means that Shakespeare may very well have acted in a play in front of him. (Of course it’s just as likely that one or both men had a cold and missed the show; that’s how nebulous Shakespeare scholarship can get.) Shakespeare likely began writing Othello the next year, and performed it for the first time in 1604. If we remember that Shakespeare was a human being and a good businessman, we get the most obvious answer to our question. The Bard had just met and performed for a Moor who was a superstar. England’s relationship to the Ottoman Empire and to Moors was a pressing issue. Moors were so hot right now back then. From there, we can imagine our inspired playwright casting about for a story about a Moor—Shakespeare’s plots were mostly unoriginal and adapted—and finding Giraldi Cinthio’s Hecatommithi, a short story collection modeled on the Decameron. Shakespeare takes two cups of Cinthio, mixes a few dashes of purloined “facts” about both Africa and Venice from recently translated books and, in a couple of years, he’s baked a play. 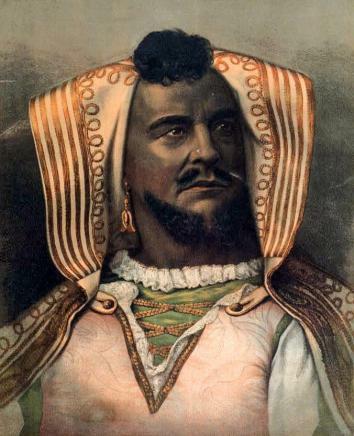 Actor Ira Aldridge as Othello, between 1840 and 1863, Antwerp, Belgium. 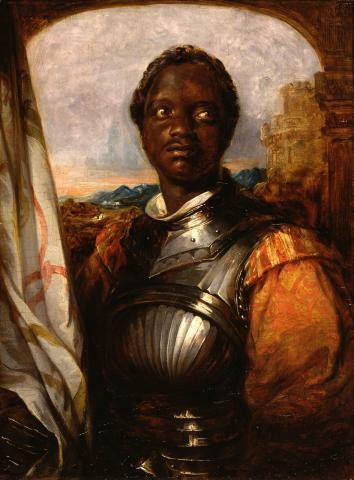 Othello, then, may have appeared at the time as an ex-Muslim—he mentions his baptism within the play—who slowly reverts to behavior that is more stereotypically “Muslim.” The Tragedy of Othello, the Moor of Venice could be read as a nightmare about the impossibility of conversion and assimilation, meanings within the play that are less visible to us because we lack the original audience’s context. Othello could be talking about Desdemona as the abused Venetian or, according to Sisneros, “he could be even referring to himself. He killed the good part of himself, thus ‘traducing’ the Venetian state.” Either way, it’s hard to escape the sense that Othello is explicitly saying he has “turned Turk” by the end of the play. It could also be that Othello’s blackness provided Shakespeare a new way to explore questions that consumed his playwriting at this time in his career: What is identity, and how is it formed? What is a man? What is an Englishman? 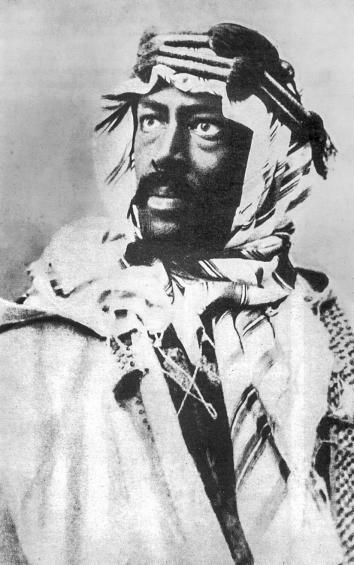 Russian actor Constantin Stanislavski as Othello in 1896. 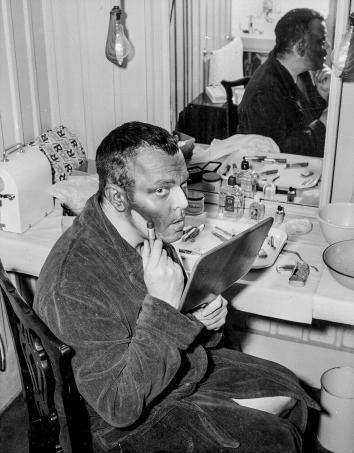 American actor Orson Welles paints his face black for the role of Othello in 1951. Othello only uses the word “black” to describe himself twice. Once, as he contemplates Desdemona’s infidelity, he says that perhaps she has strayed because “I am black/ And have not those soft parts of conversation/ That chamberers have.” Later, he says that if she’s cheated on him, “Her name, that was as fresh/ As Dian’s visage, is now begrimed and black/ As mine own face.” His otherness, the “passing strange” aspects that made him alluring to Desdemona, have now become ugly in his eyes—because he believes they’ve become ugly in hers. His entire conception of who he is has changed, paving the way for the murder of his new bride. 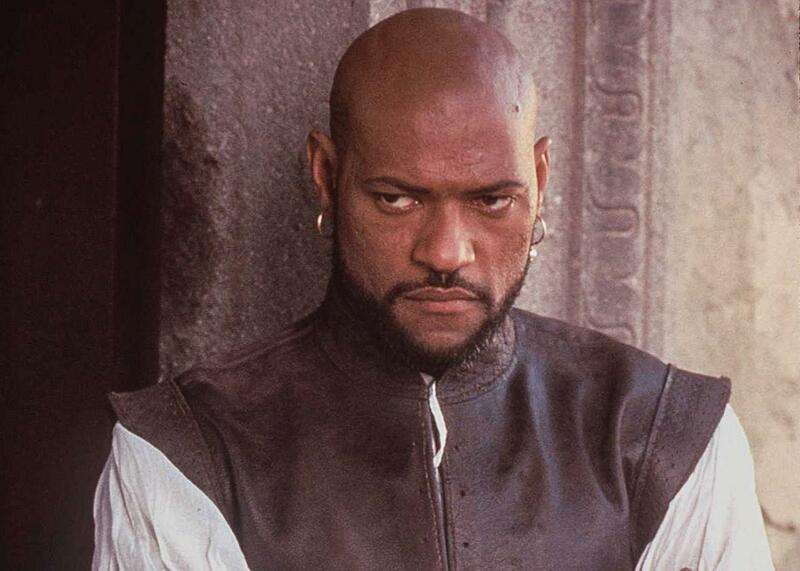 Lawrence Fishburne as Othello, Dec. 1995. Throughout his career, Shakespeare was conflicted about identity at the moment when the question What is an Englishman? was as vital to his audience as questions about identity are to us today. “In Twelfth Night you have the idea that you could make someone insane simply by telling him he’s insane,” Spiro said. “If Richard III had had a straight back, would he be a good person? Is his crooked back a sign that he is a bad person, or do we treat people with crooked backs badly?” To Spiro, the terrifying note Shakespeare sounds again and again, despite being a word-drunk pioneer of the English language, is that talking about it doesn’t help. Hamlet can’t reason his way out of the trap of the self. Neither can Othello, who is helped neither by logic, nor by proof, nor friendship, nor even by language, because all of these normal ways of making sense of the world have been arrayed in a conspiracy against him by Iago. All along, the play is asking what makes a person, what is identity, and how belonging to an identity group shapes who you are. These questions haunt us today, but they were important to Shakespeare’s audience as well. Moors weren’t the only converts, after all. The entire nation had recently “converted” to the Church of England. If, according to your new faith your goodness is never guaranteed, and if all Iago needs is two days to turn a noble convert and trusted military leader into a monster, imagine what he could do if left alone with you.